Bennington Girls Are Easy by Charlotte Silver has a good premise: chronicle the friendship of two Bennington grads from their early twenties to their mid-thirties as they experience moving to New York City, meeting men, finding their professional footing, and navigating friendship as young adults instead of college students. Sadly, Bennington Girls Are Easy did not live up to my expectations. And now the negative. The characters! They were vapid, self-absorbed, materialistic and uninteresting. All of them. It was impossible to care about any of these women. The two main characters had a falling out halfway through the book, and they were each just so awful to each other that I couldn’t bother to take a side. 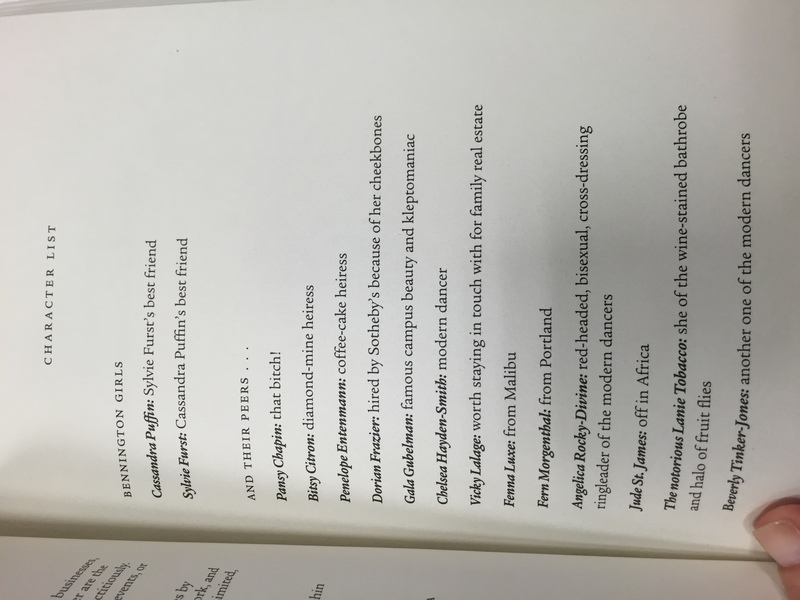 These women went to Bennington, and not a single one of them had a job, not to mention a career. One was at least entrepreneurial in her late 20s, launching a lemonade stand (!) in Brooklyn that she turned into a company that made seasonal locally-sourced jam, but even that business tanked after a few years. I think the hardest thing for me to take was that these women showed so little evolution of their worldview over a decade. One character appeared to mature a little bit, showing some sense of self-awareness of her privileged place in the world, but her awareness quickly turned into bitterness and cynicism, her self-absorption intact. 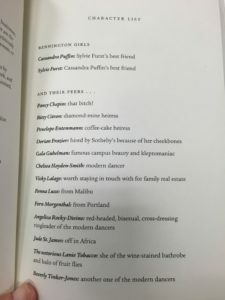 I do want to give credit to Rachel Fulginiti, who did a masterful job with the audio version of Bennington Girls Are Easy. If it weren’t for her entertaining, breathy delivery, I would have given up on the book a long time ago. She made it much funnier and kept me going. Bennington Girls Are Easy was not without its touching moments, but they were few and very far between. I was mostly annoyed as I read it, which is never a good sign. There’s probably a band of rich New Yorkers who would appreciate this book, seeing themselves in the WASPy characters who have very few cares in the world, but I think it is less palatable for a wider audience. I was in NY for business yesterday, and was in the neighborhood of The Strand bookstore. I decided to stop in for a quick visit, armed with my Goodreads To-Read list. Even though I know this probably isn’t true, I feel like I won’t be in NY for months and months after the baby is born, and that I need to stock up on books now. 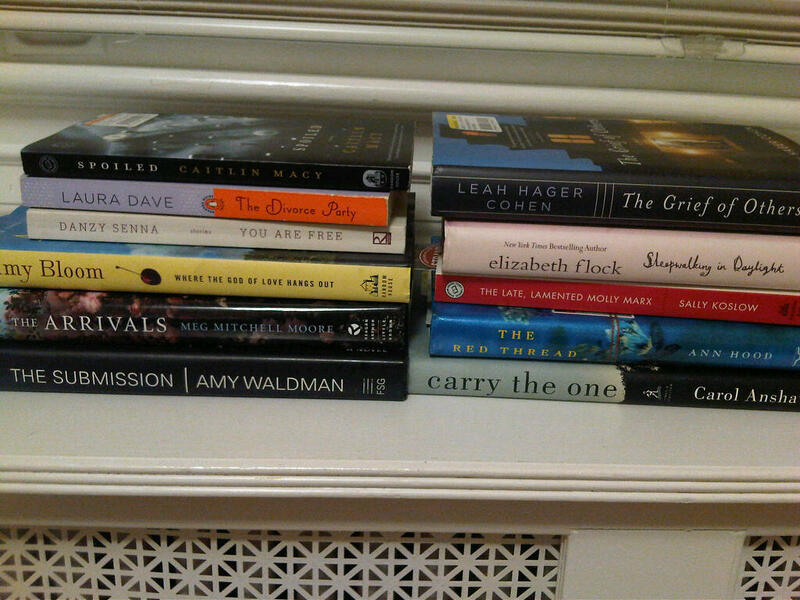 And because I have no books at home on the TBR list… (ha!). 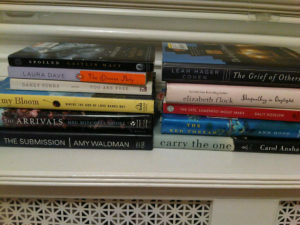 These are all contemporary fiction. The Grief of Others by Leah Hager Cohen – I keep reading good things about this one. Another in the Parent’s Worst Nightmare camp. If you’ve read any of these titles, let me know what you thought of them! Chick lit is alive and well. I am not usually a big fan of the genre, but perhaps due to year-end exhaustion I decided I was in the mood for something light, and picked up a review copy I’d been sent of The Hazards of Hunting While Heartbroken by Mari Passananti. All of the ingredients are here: Manhattan thirtysomething heroine, dependable best friends, bad recent breakup, guy who seems too good to be true. But I was pleasantly surprised by how original this book was. Passananti’s heroine is Zoe Clark, a legal headhunter whose fiance (and boyfriend of ten years) left her because he was gay. Zoe is in a stressful job with a tyrannical boss and is also in danger of losing her apartment because she can’t make the rent. In swoops a successful ad exec who sweeps her off her feet and seems to be her ticket to emotional happiness and financial stability. But she has nagging doubts about him, and ultimately decides to do some detective work to find out if he is really who he appears to be. I liked Passananti’s crisp, witty writing and her depiction of Zoe’s life in NY. It’s an engaging read, and I kept wanting to get back to it to find out what happened. (I may have skipped ahead a few times just because I coudn’t stand the suspense! Bad habit, I know.) Overall, I enjoyed this one a lot. A few characters bordered on caricatures, which always bothers me, but not all of them. If you’re open to chick lit, I recommend The Hazards of Hunting While Heartbroken. It’s fun and memorable and worth the time. It’s also a first novel for Passananti, from a small press, so check it out if it sounds appealing and let’s reward a talented first time novelist! I also just found her blog, The Little Grape.